AT&T added the 2,000th compressed natural gas (CNG) vehicle in its corporate vehicle fleet – a Ford E250 van deployed in San Leandro, California. This milestone is part of a $565 million planned investment to replace approximately 15,000 fleet vehicles with alternative-fuel models through 2018. 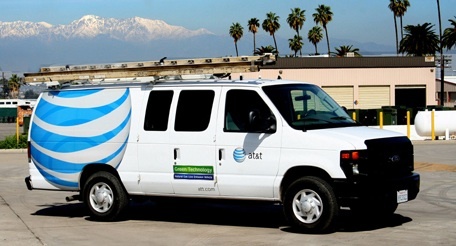 Currently, the AT&T corporate fleet includes more than 75,900 vehicles. “The deployment of our 2,000th compressed natural gas vehicle is an important marker in our long-term strategy to reduce both costs and greenhouse gas emissions within our corporate fleet,” said Jerome Webber, vice president, AT&T Global Fleet Operations. “We’re becoming less dependent on foreign oil while signaling that a viable alternative-fuel choice exists today, right here in the U.S.” The milestone deployment follows the November rollout of a first-of-its-kind medium-duty truck converted to CNG. This specialized Ford F-450 truck is equipped with a hybrid-electric system to power the aerial device. This customized truck is the latest addition to AT&T’s diverse alternative-fuel vehicle fleet. In addition to the CNG vehicles, AT&T operates a mix of alternative-fuel vehicles that include hybrid-electric and all-electric vehicle models. Earlier this year, AT&T deployed its first all-electric cargo truck and announced plans to deploy additional all-electric fleet vehicles such as the Ford Transit Connect Electric. Through 2013, AT&T anticipates purchasing approximately 8,000 CNG vehicles at an anticipated cost of $350 million. AT&T expects to spend an additional $215 million through 2018 to replace approximately 7,100 fleet passenger cars with alternative-fuel models. Save 49 million gallons of gasoline over the 10-year deployment period. Reduce carbon emissions by 211,000 metric tons– the greenhouse gas equivalent of removing 38,600 passenger vehicles from the road for one year.